A rip-roaring, high-octane, Texas-sized thriller, featuring two friends, one vixen, a crew of washed-up radicals, loads of money, and bloody mayhem. Hap Collins and Leonard Pine are best friends, yet they couldn't be more different. Hap is an East Texas white boy with a weakness for Texas women. Leonard is a black, gay Vietnam vet. Together, they stir up more commotion than a fire storm. But that's just the way they like it. So when as ex-flame of Hap's returns promising a huge score, Hap lets Leonard in on the scam, and that's when things get interesting. 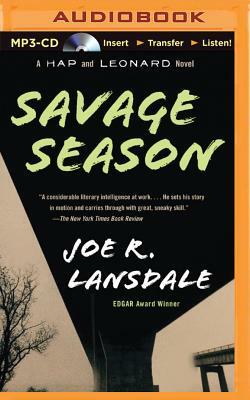 Chockful of action and laughs, Savage Season is the masterpiece of dark suspense that introduced Hap and Leonard to the thriller scene. It hasn't been the same since. "The most consistently original and originally visceral writer the great state of Texas (or any other state for that matter) has seen in a score of flashpoint summers." - The Austin Chronicle "Lansdale has an unsettling sensibility. Be thankful he crafts such wild tall tales." - Chicago Sun-Times.